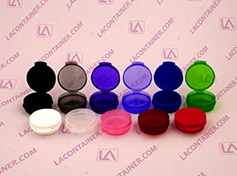 The Lacons® hinged lid plastic containers make for the best cosmetic sampling containers in the industry. These small sample containers are great for your beauty lotions and creams because we use only the highest grade polypropylene plastic in our containers. this high quality plastic is FDA compliant and BPA free, ensuring the Lacons® are the safest containers for your makeup sampling needs. 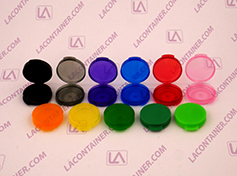 Thanks to the Lacons® air and moisture resistant hinged lid, your cosmetic samples will be safe inside the container from spills and air born contaminants. Made in the USA and available in numerous sizes and colors, these containers are sure to fit your sampling needs. Feeling a little more adventurous? Check out our Shell-Cons seashell shaped cosmetic containers. 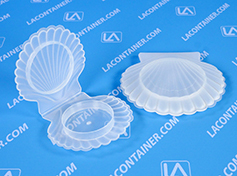 These containers feature a similar round inside to the lacons® but have a unique seashell shaped outer look that is sure to impress your clients!